sprouted moong recipes. Moong beans when washed, soaked and kept aside for a day or two sprout easily and are quite delicious. They are crispy but also soften when cooked properly making them perfect for salads and subzis. They can easily be stored in the fridge and are super easy to cook and incredibly healthy. They are easily available in the market but you can make them at home as well. We have a recipe on How to make Moong Sprouts that you can check out. Having moong sprouts early in the morning, along with other fresh fruits and other ingredients, makes for a power pack, nutrient rich Anti-Ageing Breakfast Platter. A brilliant combination of chawli and moong sprouts with other Indian spices like cumin and amchoor gives a really enticing and flavorful Chawli and Sprouted Moong Salad which is great for people who have a high blood pressure. Healthy Moong Chaat will make you forget about the unhealthy stuff you have been eating! Brimming with iron, vitamins and fiber and flavored with ginger-garlic, this instant chaat will solve your hunger pangs right away! Healthy Kofta Kadhi replaces the fried koftas with steamed moong sprouts in this scrumptious recipe which not only lowers cholesterol but is also delicious. A lot of Indian recipes call for moong sprouts. This not only adds a healthy value to whatever you are eating, but also a slight crunch and slightly sweet flavor profile. A simple, hearty bowl of Sprouted Moong Methi Pulao, where all the ingredients – rice, methi, sprouts and spices – are cooked together. The aromatics and taste is so fantastic, you won't need anything with it. An accompaniment to go along with any other rice dish, made with moong sprouts, can be this fantastic Gujarati Moong Sprouts Dapka Kadhi. The delectable street food enjoyed most by Maharashtrians, Misal Pav, is also made with moong sprouts, believe it or not! It contains a mix of various sprouts and spicy masala which makes it the best street food to have! Something simple yet really different is Mixed Vegetables in Green Moong Gravy. This dish, similar to the Gujarati Undhiya, uses moong sprouts in the gravy by grinding it into a paste rather than as a main vegetable of the dish. Another way to pamper yourself is to make this rich Moong sprouts Korma in a tangy tomato puree. Sprouts can be eaten in different ways and each way is as enjoyable as the others. Grinding up sprouts with chillies and ginger, mixing with methi and cooking on a hot tava will make the most delicious Sprouted Moong and Methi Chilla. On a similar line, we have pessarattu, a moong sprout chilla eaten in the Andhra Pradesh, with onions and ginger. We can give a twist to this and add bajra love for the additional taste and make Moong Sprouts and Bajra Pessaruttu. Who doesn’t like pakodas? They are an excellent companion to your evening tea and taste even more delicious when made with moong sprouts. These Sprouted Moong Pakodas are wonderfully green and crispy and do not disappoint! Sprouts Tikki can also be made, in a scrumptious, healthy way, with the freshness of mint and coriander and is great for everyone, whether health conscious or not! May it be due to the color or the health benefits, more and more people are incorporating moong sprouts in their diet, in one way or another. In an insane collection of flavors, that is healthy too, the Indian Sizzler is a heart stealer. With tikkis, a tangy tomato gravy and loads of veggies, this sizzler is healthy and delicious too! An excellent way to add sprouts is to add them to dhokla! Sprouts Dhokla puts the regular khatta dhokla to shame with its vibrant green color and mixture with spinach. Hope you liked this collection of Sprouted Moong Recipes. 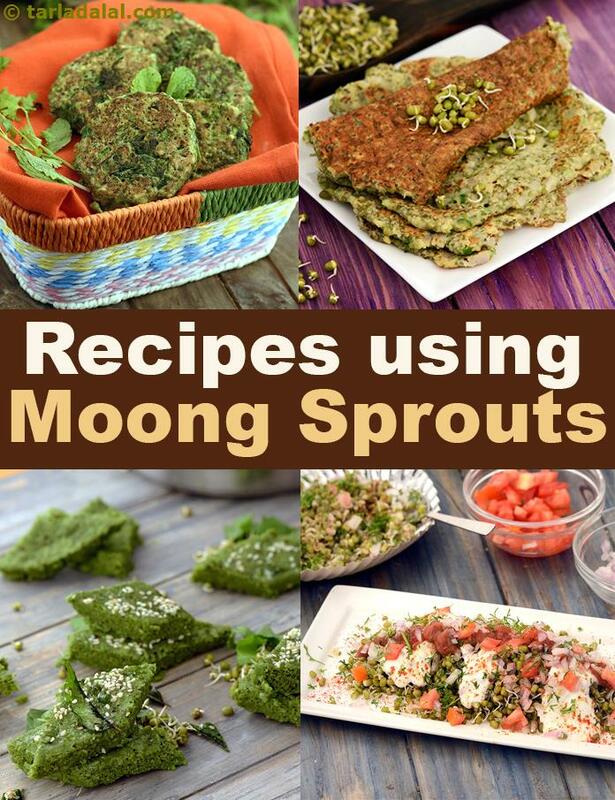 Check out more recipes with moong sprouts below! Protein-rich moong sprouts pulao can be made quite easily and quickly in the microwave. Keep some sprouts ready at all times, so that you can whip up such easy but healthy meals in a jiffy!